Francophones are commemorating a campaign they launched 20 years ago this week to save Ottawa's Montfort Hospital, the only French language hospital in Ontario at the time. Dr. John Joanisse was Montfort's chief of staff in 1997. (Radio-Canada)It took five years of rallies, lobbying, and court battles, but they eventually convinced the Ontario government to keep the hospital open. On Monday, many of those activists gathered at Samuel-Genest high school in Ottawa's east end for a panel discussion to remember the battle they began in 1997. 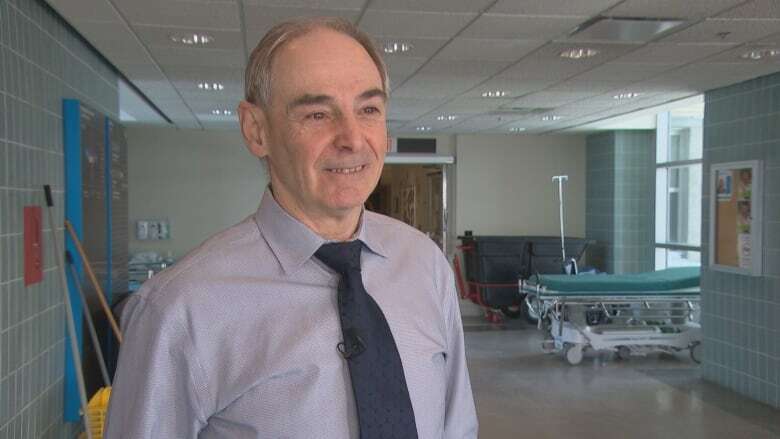 Dr. John Joanisse was Montfort's chief of staff in early 1997, when the Progressive Conservative government of Mike Harris announced it would accept a recommendation from its health services restructuring commission to close the hospital. "We felt insulted. How could they do this to us, to Franco-Ontarians? This was our hospital," said Joanisse. 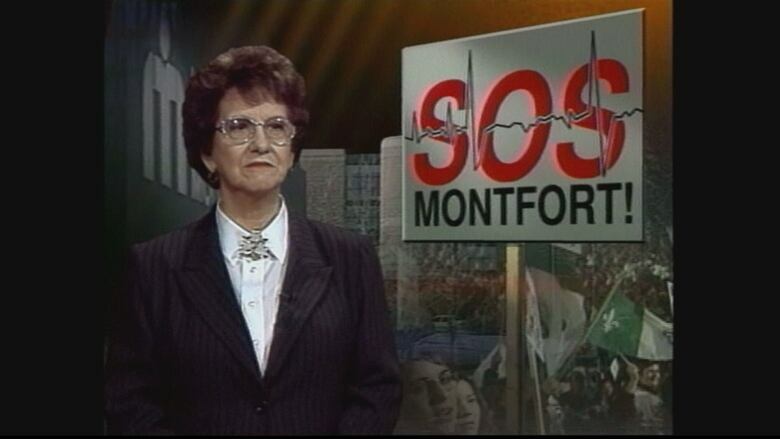 The francophone community quickly mobilized, launching a grassroots campaign called SOS Montfort, led by the former mayor of Vanier, Gisèle Lalonde. The Ottawa French language daily newspaper Le Droit also jumped into the debate, firmly placing its support behind SOS Montfort. Pierre Bergeron was the paper's president in 1997. "There was a new threat facing one of our fundamental institutions and threatening our collective good," said Bergeron during Monday's gathering. "For Le Droit, it was a matter of connecting to our identity." Gisèle Lalonde, pictured here in 1997 as president of SOS Montfort, led the five-year-long effort to save the hospital. (Radio-Canada)SOS Montfort's efforts also included 2,000 students forming a human chain around the Montfort, and a pep rally of 10,000 supporters at the then-Civic Centre at Lansdowne Park. In the end, Ontario courts put a wrench in the provincial government's plan after the hospital and its supporters launched a legal battle to keep the hospital open. After losing in divisional court, then again on appeal, the province announced in February 2002 that it would not appeal to the Supreme Court of Canada. Lalonde said the reunion of Montfort supporters generated mixed feelings. "I'm very glad we won. 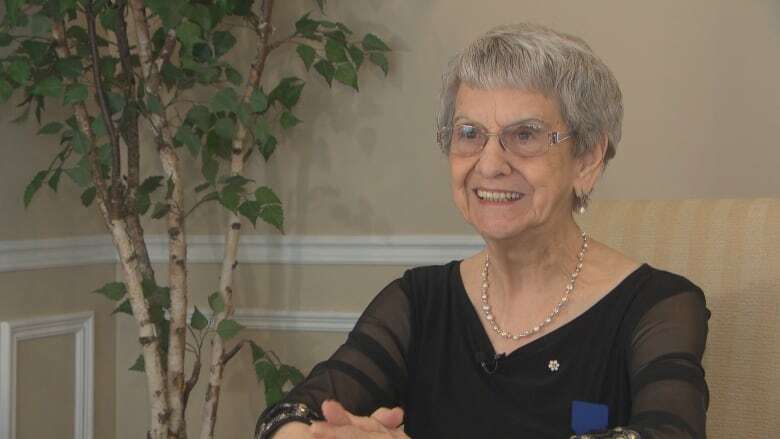 But it brought back memories of the battle with that anglophone government, which understood absolutely nothing and didn't want to hear anything from us," said Lalonde. 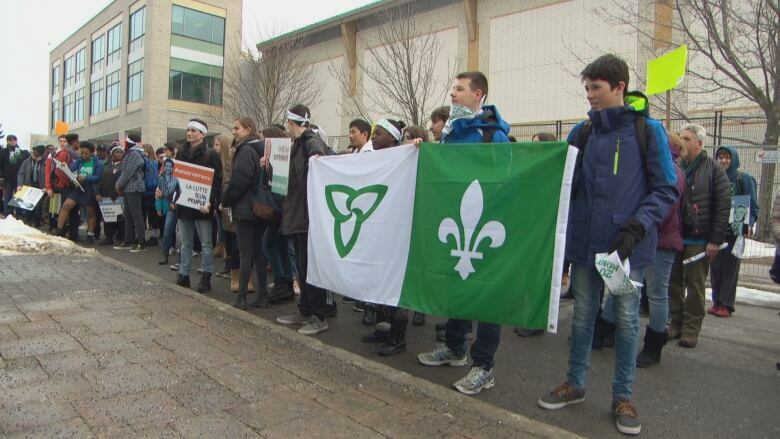 Students from Collège catholique Samuel-Genest marched Monday from their high school to the Montfort Hospital, commemorating a similar march by Cité Collégiale students in 1997. (Radio-Canada)However, time seems to have repaired Lalonde's rift with Mike Harris and his government. "I received a very nice, friendly letter from the premier [Mike Harris], and I excused everyone who worked against the Montfort," she said. Now 83, Lalonde said many people she meets on the streets of Vanier still kindly refer to her as "Madame Montfort." In honour of the fight launched 20 years ago this week, students from Samuel-Genest marched Monday from their school to the Montfort, all while proudly displaying the green and white Franco-Ontarian flag. A rally and concert is also set for Wednesday at TD Place, the site of the large rally in 1997 which helped launch SOS Montfort. 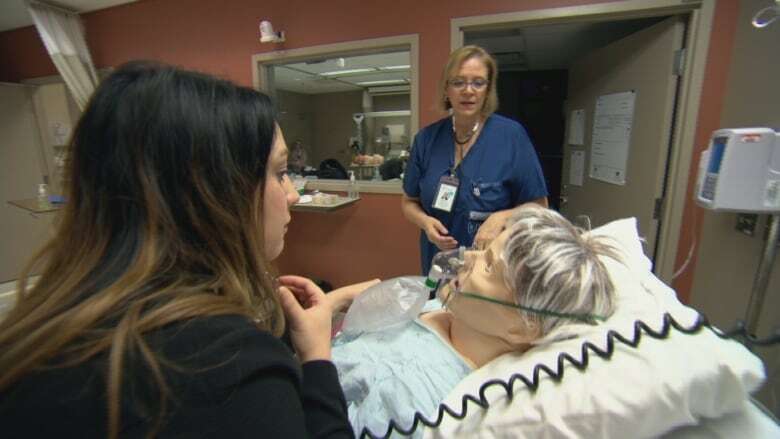 On Friday, the hospital is officially launching its Institut du savoir Montfort (ISM), a facility it says will improve training for doctors, nurses and other health professionals in a francophone environment.